The Blue Corn Maiden is said to be the most beautiful of the corn maiden sisters. The people loved her very much and they loved the blue corn that she brought to them all year long. Because of this, they felt peace and happiness when she was amongst them. One cold winter morning, the Blue Corn Maiden went to gather firewood. This wasn’t a typical chore but she wanted to be helpful. She was outside of her house, when she saw Winter Katsina. Winter Katsina is the spirit whose breath creates the cold wind. He brings winter to earth wearing a blue and white mask. When he saw the Blue Corn Maiden, he fell in love. Winter Katsina told the Blue Corn Maiden that she must go to his house. There, he blocked the windows with ice and the doorway with snow and he took her as his prisoner. Even though, Winter Katsina loved her and treated her well, she was sad. She missed her home and wanted to make blue corn grow for the People of the Pueblos. One day, Winter Katsina went out to to scatter snow on the mesas. While he was away, Blue Corn Maiden pushed the snow from the door and went to look for the plants she loved to find in summer. Beneath the snow, all she could find was four blades of yucca. She took the yucca to Winter Katsina’s house and made a fire. Once the fire was started, snow in the doorway melted away and in walked Summer Katsina. Summer Katsina had fresh corn in one hand and blades of yucca in the other. He walked toward the Blue Corn Maiden. At that moment, Winter Katsina blew winter wind through the doorway. He held an icicle in his hand like a flint knife, and a ball of ice in the other. As Winter Katsina blew cold wind, Summer Katsina blew warm breeze. When Winter Katsina raised an icicle knife, Summer Katsina raised burning yucca leaves to melt the icicle. Winter Katsina saw that he must make peace with Summer Katsina. The Winter and Summer Katsinas agreed that Blue Corn Maiden would live among the People of the Pueblos for half of the year, in the time of Summer Katsina. The other half of the year, Blue Corn Maiden would live with Winter Katsina.Blue Corn Maiden left with Summer Katsina, and she became the sign of springtime, eagerly awaited by the People of the Pueblos. There are still times when after spring has come, Winter Katsina will blow cold wind and scatter snow. This is simply to show that he is angry for having to share Blue Corn Maiden for half of the year. Blue corn is an essential part of Hopi culture. The Hopi use blue corn in ceremonies naming their infants and believe it represents a long life. Hopi men ate it before long journeys and to this day, they believe in its power. The Hopi have a reputation as superior dryland farmers. Their conservation is reflected in their crops – most notably in blue corn. Blue corn has several advantages over other corn. It contains 20% more protein and a lower glycemic index. When used for tortillas, blue corn produces a sweeter, nuttier taste. Combine the dry ingredients in a large bowl and stir. (I have seen a recipe that also includes oats at this point) Add oil, eggs, and milk and mix well. Drop by spoonfuls on a lightly oiled griddle, turning once as cakes brown – usually three to four minutes. Serve with the condiments of your choice and maybe fresh orange slices from a community citrus gleaning. Love the story. Its so much fun to remember veggies when there is a story like that backing it. In my country, we have a story about pumpkins 🙂 Makes me want to blog about it. I will look forward to your post Rukmini. I hadn’t heard that story and I really like it! There was a Hopi festival here recently and I was able to purchase a katsina of an artist whom I have followed. That caused me to do some research and I was so happy when I found the story. I love this story! Perfect for this time of year, too, as winter and summer seem to be battling. Thank you, Tammy! They are battling, aren’t they Cindy? I see it in the weather news all around – but not here. I didn’t know blue corn those acts about blue corn. Know wonder I like it better than yellow. 😉 I also enjoyed the Hopi story of spring. ‘Ve never heard that before – thanks for sharing! It has a nuttier taste than regular corn. The compromise in the story reminds me of a Greek myth that I think is Hades and Persephone, but I will have to double check. It has been so long since I taught it. I love this story. I think it is important for all of American youth to learn those stories. You’re right. We should learn these legends. I love blue corn! And what a wonderful story. I do too Carrie and I’m trying to decide how much of my “like” is because it is blue and how much is due to taste. What a beautiful story! I absolutely love blue corn pancakes! Thanks for sharing. I found some great blue corn flour at Native Seed Search. Like others I’ve truly enjoyed the story. I’ve never seen or tried Blue Corn, I wonder what it’s taste is like? It’s grown here where we live so not uncommon. It is nuttier than regular corn. I’ve heard that from a few folks in the far North and East. It’s challenging to retell a legend without losing the integrity of the story and while not copying it. What a wonderful story, thank you for your research as well as your recipe. I don’t know where I’ve seen it for sale around here, but I’ll keep an eye out. It may be more of a specialty item where you live. We’re fortunate that it’s such an important crop here. The story reminds me a little of the Greek myth about Persephone. 🙂 I love blue corn, and wish it were easier to find products made with it here. Your hotcakes sound delicious! Clearly not up on my Greek mythology! Maybe we set up an export to Paris? What a great story! I would like to try making blue corn tortillas! I haven’t seen any blue masa harina around here though. I am on a mission now! I have had blue tortillas but mainly in chips. Never had blue corn, but I’ve had the blue corn chips! Me too. I like them. I hadn’t heard that story. Lovely. Would love to grow blue corn on the farm. Perhaps I’ll try it this year. It would be interesting to see what the effect is in a more humid climate. Thank you for sharing more info about blue corn! I always learn good things from you! Do you ever see it where you live Debbie? It’s a pleasure to have learned it and to retell it. I have never come across blue corn before in Belgium! Will check it out! A lovely post with a tasty recipe too! Well, like Camille in Paris, perhaps we’ll have to begin to export? My kind of post, Tammy. What an enchanting tale. I love the idea, instantly, of Winter Katsina and Summer Katsina. You have enriched my day today: thank you. Most welcome Kate. I believe there are parallel tales in other mythologies but this one suits our current location best. On the one hand, I love this story, and all such stories, for showing us how cultures throughout time have created mythologies through which to explain the world. I think it’s probably best I just focus on the deliciousness of your food. Mmm, blue corn anything. Love it Hannah. Perhaps I will use your ire to inspire a new recipe – blue corn woman comeback! They do make a beautiful centerpiece, don’t they Estrella? What a lovely story! I love how food comes with its own history and mythology. Such importance should be placed on our food! Corn is rare where I am now (UAE) but will definitely try these when I’m back home for the summer! Thanks for a great story and a great recipe! Food stories and histories are important to remember. They enable us to connect with one another and our past. Where can I read it June? I love the taste of blue cornflour. Some farmers in North Carolina have been cultivating it, and a local Nashville chef sources it from them for a few of his dishes. Oh terrific. I didn’t know if the moisture would be an issue since it is such a dry land crop. As I told Carrie above, I don’t know if I really love the taste more or if I just like the “blue”. Thanks Kath. This corn cob in particular sits in my kitchen. It is from the final crop of one of my Hopi friends’ father before he passed – really really special. I hear you. I hadn’t really thought of it until Hannah pointed it out so I really must give myself a writing assignment to improve upon that! Oh, it is part of the original! My next assignment is to modernize it! I had never heard of blue corn and I love the legend you shared with us. Thank you Tammy. The climate is so different where you live than it is on the Hopi reservation – that is probably why. Hi Tammy – love the story, and the recipe. Here in northwestern Ontario, Canada, we have are excited about a special squash that Winona LaDuke brought with her when she visited our community last year. The Anishinaabe name means “really cool old squash” and the squash seeds were originally found during an archeological dig in Wisconsin, preserved in a dried clay ball; they were carbon dated at 800 years old. Winona was gifted with some of the seeds, and grew them at her home on the White Earth Reservation in Minnesota. She brought us one of the “really cool old squash” from her garden, and we have preserved the seeds (there were a few hundred of them), and will share them with whoever is interested. This year will be the first year that we attempt to grow them, but the “local foods” gardeners in our Transition Town group, and our indigenous partners, are very very excited about the opportunity we’ve been given. That’s a cool story Christine. The whole notion of seed saving is a cause that me and my family support. It’s through blessings like Winona’s that we are able to retrieve some of those heritage crops. I’m not sure we can get blue corn at our local co-op. But have always loved it when sampling it at restaurants. Thanks, Tammy, for sharing the story of the Blue Corn Maiden. I am jealous that you have a local coop. Hey, good to see you. I’m sure you’re ready for some summer katsina! Learned something new. 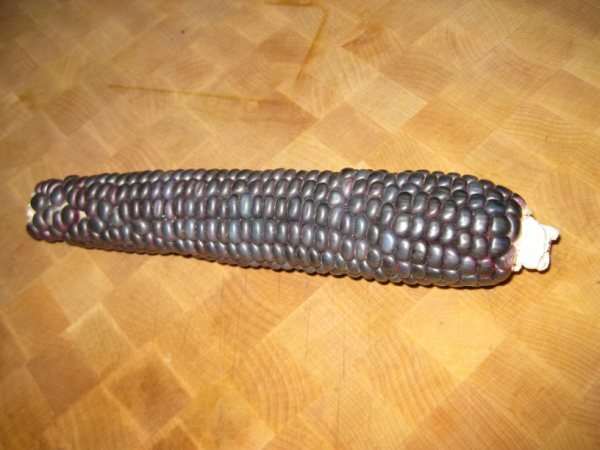 I have never tasted cooked blue corn in its naked state.